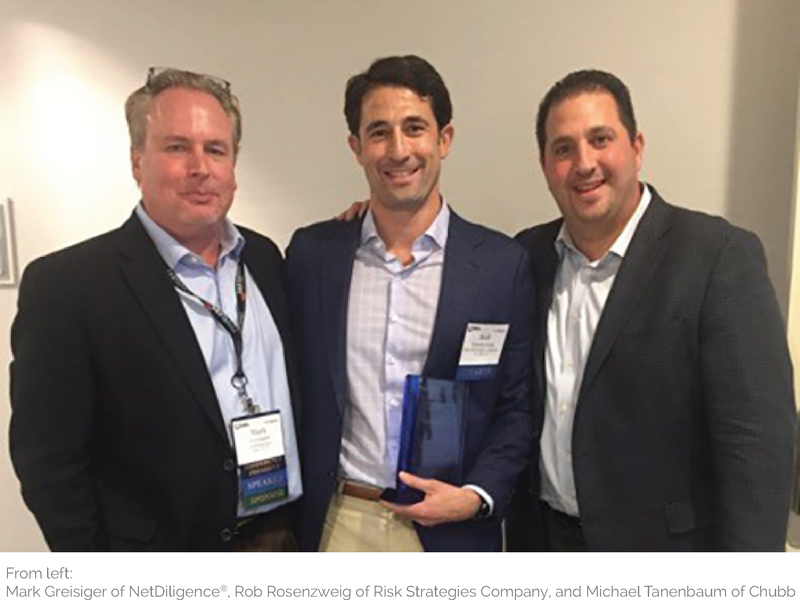 PHILADELPHIA, October 12, 2017 – NetDiligence®, a leading provider of cyber risk assessment and data breach readiness and response services, announced today that Rob Rosenzweig of Risk Strategies Company has been named recipient of the 2017 Toby Merrill Rising Star Award. The award was presented on October 11, 2017 at the company’s Cyber Risk and Privacy Liability Forum in Santa Monica. Vice President and National Cyber Risk Practice Leader at Risk Strategies Company, Rob is responsible for coordinating and growing the cyber liability business across all Risk Strategies offices nationwide. Rob currently holds a designation as a Registered Professional Liability Underwriter and he received his Bachelor of Arts Degree in Government & Economics from Hamilton College. NetDiligence presents two awards each year honoring the late Toby Merrill, an icon in cyber risk insurance. The Toby Merrill Award for Excellence is given to a seasoned cyber risk insurance thought leader each June. The Rising Star Award is given to an emerging insurance professional each October. This year’s Toby Merrill Rising Star Award is sponsored by Chubb as a tribute to Toby, who served as the company’s Division Senior Vice President and was a beloved colleague. In addition to sponsoring this award, Chubb and NetDiligence actively support the Toby Merrill Scholarship fund, which financially supports the educational advancement of students who reflect the qualities of leadership, kindness and strength that Toby epitomized. NetDiligence® is a leading provider of cyber risk readiness and response services. Since 2001, NetDiligence has conducted thousands of enterprise-level cyber risk assessments for a broad variety of organizations, including public entities, financial services, retailers, software developers, medical providers and universities. NetDiligence services are used by leading cyber liability insurers in the U.S. and U.K. to support both loss-control and education objectives. The NetDiligence eRiskHub® (https://eriskhub.com) is licensed by a majority of cyber liability insurers to provide educational and loss-control services to their policyholders. NetDiligence also publishes an annual Cyber Claims Study and hosts annual Cyber Risk Conferences in Philadelphia, Santa Monica, Toronto and London. For more information, visit https://netdiligence.com. Chubb is the world’s largest publicly traded property and casualty insurance company and the largest commercial insurer in the United States. With operations in 54 countries, Chubb provides commercial and personal property and casualty insurance, personal accident and supplemental health insurance, reinsurance and life insurance to a diverse group of clients. As an underwriting company, we assess, assume and manage risk with insight and discipline. We service and pay our claims fairly and promptly. The company is also defined by its extensive product and service offerings, broad distribution capabilities, exceptional financial strength and local operations globally. Chubb maintains executive offices in Zurich, New York, London and other locations, and employs approximately 31,000 people worldwide. Additional information can be found at www.chubb.com. The Toby Merrill Scholarship was created to change the lives of children and make a difference through education. Toby’s vision was to develop a lasting legacy by awarding financial assistance to students seeking to attend college, with the goal of empowering those deserving children to reach their full potential and experience the joys of life that Toby achieved. Scholarship recipients excel in areas of academics, athletics and leadership, and demonstrate high character traits such as kindness and strength during times of adversity. For more information or to contribute to the scholarship fund, please visit http://tobymerrillscholarship.org.